Throughout the tutorials on this design blog, I have used a variety of seams similar to those used in clothing construction. Seams are a way of joining fabric together and the more commonly used for DIY are demonstrated below. Pin, baste, and stitch, 0.5″ (12 mm) in from the raw edges. A self-neatening enclosed seam that is usually used to join sheer fabrics where no stitches show on the right side. With wrong sides together, edges matching, tack and stitch the fabric, taking a 0.25″ (6 mm) seam allowance. Refold the fabric with right sides together, to enclose the raw edges. Press edge. Gathering is used to add frills. A frill before it is gathered needs to be at least 1.5 times it’s finished length, but making it twice as long gives a much better effect. When gathering on a sewing machine, use a heavy-duty thread as the “draw core” for extra strength and couch a zig-zag stitch over the thick thread, along the seam allowance next to the stitching line. Draw up the heavy-duty thread as needed to gather. 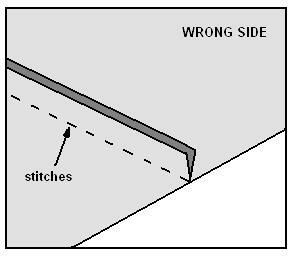 Instead of machine stitches, a small running stitch can be used especially when a short length is to be gathered. It may take longer but there is a finer row of gathering. Work a row of zigzag stitches, 0.25″ (6 mm) from the seam line and over the thicker thread. Gently draw up the heavy-duty thread from one end feeding the fabric evenly down the gathers. 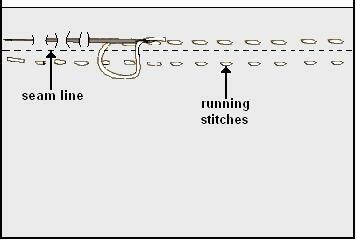 Tie off the thread ends when the required gathered length is achieved. This type of seam is popular in reversible and unlined handbags. It produces a clean inside for the bag and strong seaming with its double stitching. It works best with straight seams that have very few curves. 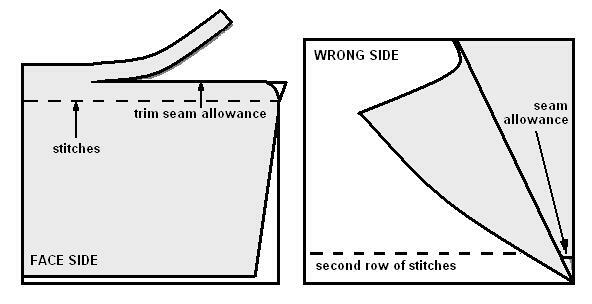 1) Place wrong sides of fabric together and straight stitch 3/4-inch from raw edge. 2) Press seam allowances to one side. 3) Trim the seam allowance that lays underneath to 1/8 of an inch. 4) Turn under the top seam by 1/4-inch, concealing the trimmed under-seam. Pin in place. 5) Edge-stitch along fold using zipper foot. This is not the same technique as used in clothing construction (see above). 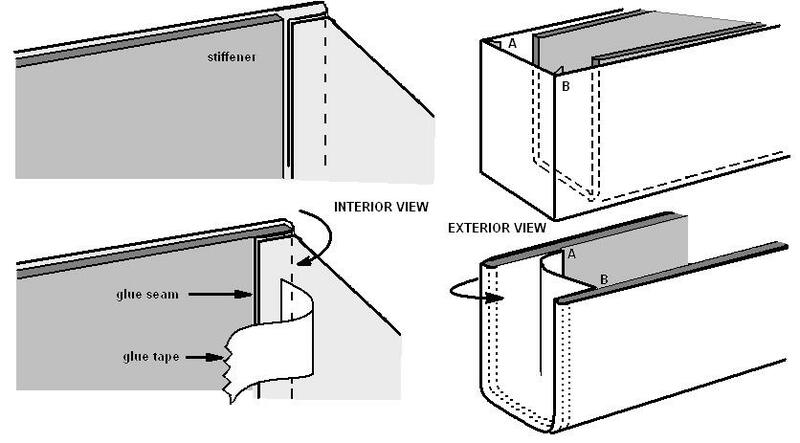 The method involves making seams by inserting a stiffening, turning and gluing the machined seam down tight. A variety of shapes and thicknesses of stiffeners can be used to create a number of silhouettes. French seams are often used on pieced bags with side gussets, panelled fronts and separate bottoms. It can be made on all round gussets so that seams appear on the front or on front panels to form side-gusset styling. Only the material turned in against the stiffening is glued but as the gusset is machined to it, the edges must meet exactly. If the material does not glue well, a piece of fabric (about 1″ wide) may be caught in machine stitching, on the gusset side strained over and stuck down to the material used.